Bashir May Be Out, But Sudanese Protesters With 'Eye On The Prize' Won't Budge Protesters are demanding that a military council give up power to civilians. Four days after longtime president Omar al-Bashir was removed in a coup, protesters faced off against troops in Khartoum. Sudanese demonstrators gather near military headquarters in the capital Khartoum on Monday. Organizers said they were resisting an attempt to disperse the sit-in where thousands of people have camped out for days. Buoyed by Thursday's ouster of longtime President Omar al-Bashir, Sudanese protesters faced off against troops during a sit-in outside military headquarters in Khartoum on Monday as they amplify their call for civilian-led rule. Demonstrators say the Sudanese military attempted to take away the barriers surrounding protesters in the road, where thousands have gathered for days. Ayman, a protester who wants to use just his first name because he fears retribution, told NPR that the barriers' removal would have effectively dissolved the protest but the demonstrators managed to stop the troops. The main protest group, the Sudanese Professionals Association, issued an "urgent appeal" on Twitter, calling on additional protesters to step in and protect the area from the armed forces. Video from the scene shows a group of chanting and flag-waving demonstrators hustling toward the troops, some perched atop vehicles. Media reports said the standoff ended peacefully with no bloodshed. 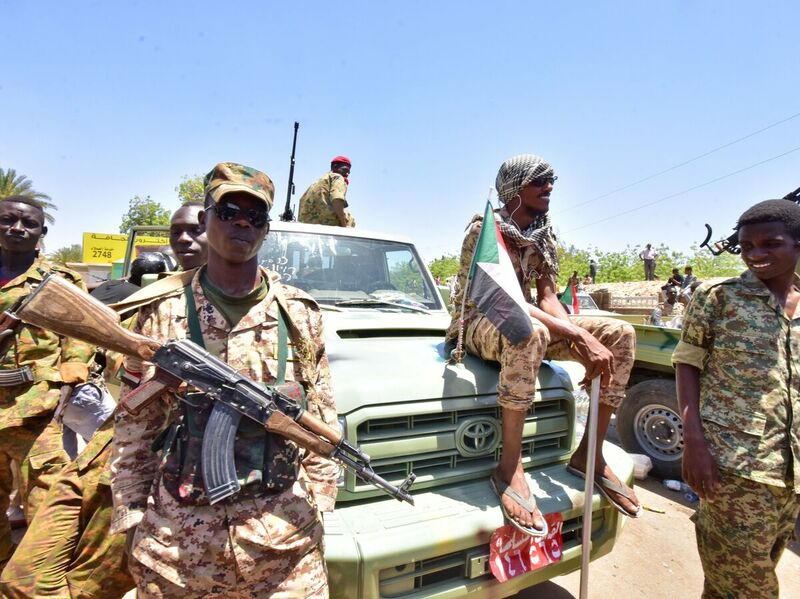 But it underscored the tenuous nature of Sudan's transition as military leaders vie for power in the vacuum Bashir has left behind, and activists fear a continuation of the old regime passed along to loyalists. "These people are really fearless," Ayman, a university lecturer who has been spending nights at the sit-in, told NPR. "People come in knowing that they might die." Sudanese armed forces gather near the site of a demonstration close to the military headquarters in Khartoum on Monday. The Sudan Doctors Committee, an affiliate of the umbrella SPA group, said Friday that more than a dozen people had been killed "under the military council" since the coup occurred just one day earlier. The military council took control after Bashir's arrest and removal from office, announcing it would rule the country for two years before democratic elections take place; terms unacceptable to protesters and opposition leaders who are demanding a transitional civilian government assume power immediately. "People are still keeping their eye on the prize of a full democratic transition to a civilian-led government, not a military-led government," Mayada Hassanain, an economist based in Khartoum who has taken part in months of protests, told NPR's Weekend Edition. The military-led government has resembled a game of musical chairs. Gen. Awad Ibn Auf, who helped lead the coup, served as president for a single day before stepping down. He named Lt. Gen. Abdel-Fattah Burhan as the new leader. The head of the National Intelligence and Security Service was also reshuffled over the weekend. The military council announced Sunday it would name a civilian prime minister and Cabinet, but has not yielded to demands to name a civilian president. Analysts say Bashir, an autocrat who took over in 1989 in another coup, has left behind a deep state that may prove difficult to root out. "What is clear is that there has not been a clear break from the old regime," Murithi Mutiga, deputy project director for the Horn of Africa at the International Crisis Group told NPR's Halima Gikandi. "And what we know is that what the military says and what the military does can be quite different." 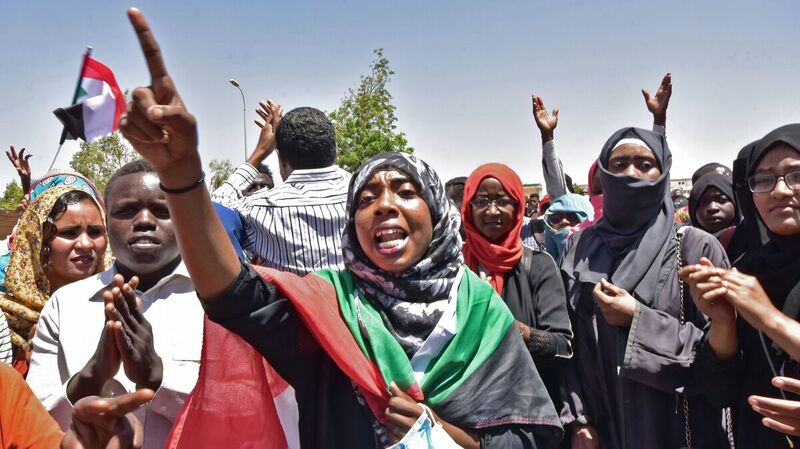 This latest round of protests initially ignited late last year in response to economic woes, before spreading and turning political, culminating in the military's removal of Bashir. The lead-up to his ouster was not entirely smooth. The United Kingdom, Norway, the United States and Canada issued a joint statement in January calling for the immediate release of political activists, protesters and journalists detained without charge. And international human rights groups have raised the alarm about scores of people reportedly killed in the months before Bashir's ouster. On Sunday, the U.S. Embassy in Khartoum issued another joint statement expressing support for the protesters and appealing for peace. "Sudan needs an orderly transition to civilian rule leading to elections in a reasonable time frame." But in separate statements, Saudi Arabia and the United Arab Emirates expressed support for the military council. As for Bashir, he reportedly remains under house arrest. The 75-year-old is facing international charges for war crimes in connection with genocide committed in Darfur. Activists say the protests will go on until their demands are met. Hassanain told NPR the movement is largely youth-based with some protesters as young as 15, who, despite the risks, are eager to usher in a new era for Sudan. "It's amazing to see all these people out on the streets literally putting themselves on the frontline of death to fight for their own futures and future generations."